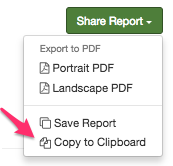 To get a Figured report into a spreadsheet, simply click Share Report > Copy to Clipboard and then paste that it into a blank spreadsheet. The copied report will paste into your spreadsheet as it appears on Figured (formatting included). Please note that the underlying formulas will not be brought through, so any changes made in the spreadsheet will have to be calculated manually moving forward.